THE EXPERIENCES THAT MATTER. THE MEMBERSHIPS THAT BRING THEM ALL TO YOU. Each of our clubs is a special place—a third place, if you will—somewhere apart from home and work where you feel comfortable, happy, and welcome. It’s what we call the Bay Club Lifestyle. And we invite you to enjoy this lifestyle with a custom membership designed especially for you. Select your region and explore our offerings to find the collection of benefits and privileges that you and your family desire. Then get ready for the experiences that will have you living life Bay Club Happy. Featuring our most coveted memberships, the Club West Collection offers access to our top-tier amenities at country clubs and sports resorts across California—plus exclusive access to our signature transferable membership option. Start your day on the course, with convenient tee times and renowned five-star hospitality. Or meet a friend for tennis with exclusive court booking, while the kids romp to their hearts’ content with complimentary access to the Play Club. With four unique levels from which to choose—featuring tiered access to a thoughtfully curated assortment of amenities and services—Club West is the membership of more. Unlimited complimentary golf, tennis, and squash access Our ultimate sports experience—year-round, at any club. 14-day advance booking on sports, childcare, and Connect You're first in line every time—on the greens and at the Club. Waived cart fees, complimentary walk-on driving range use, and full access to protected tee times Make the course your own with unfettered access. Priority registration for all club tournaments and events Keep your competitive edge sharp. Complimentary Connect Workplace Suites access Meet your clients at the Club and show them how you do business. Up to 16 complimentary Lifestyle Points each month Treat yourself to personal training or a relaxing massage—or save for use toward other perks. Complimentary golf, tennis, and squash access All the sports, none of the fees. 9-day advance booking for golf, tennis, and squash A robust sports schedule—always on your schedule. Preferred driving range access and waived cart fees Practice and play without extra fees or restrictions. 48-hour booking privileges for protected tee times Access to coveted time slots with your flexible schedule. Unlimited Connect usage + 9-day advance booking Working remotely was never so easy or felt so good. Up to 10 complimentary Lifestyle Points each month Use for corkage on a favorite bottle of wine or save for other perks. Minimum transferable fee of $25,000 required for memberships providing access to Manhattan Country Club. 5-day advance booking for golf, tennis, and squash Schedule game time when it works for your schedule. Increased driving range access and waived cart fees More fun on the greens and increased savings. 48-hour booking privileges for protected tee times The game you love and the access you desire. 50 hours of complimentary Connect, plus 5-day advance booking Spend even more time outside the office with all the comforts of home. Up to 8 complimentary Lifestyle Points each month Use for an indoor court or round of golf—or save for other in-club perks. 4-day advance booking for golf, tennis, or squash Spend more time on the court, or course. 30 hours of Connect Workspace Suites, plus 4-day advance booking Spend more time outside the office. Up to 6 complimentary Lifestyle Points each month Use for guest passes or roll over to use on an array of in-club services. Inspired by the active urban professional, our Executive Club memberships offer the flexibility of access to multiple club locations within a campus or region, with an emphasis on fitness and social activities. So whether you’re an urbanite who lives in one city and works in another, or a busy mom who shuttles kids from place to place, this membership option gives you easy access to our fitness amenities and club services wherever your day takes you—for the lifestyle you love and the convenience you crave. Fitness, aquatics, basketball, group exercise, social programming, and childcare privileges, and more Enjoy a wide assortment of amenities designed to enhance your active lifestyle. Squash court access at Bay Club San Francisco and Bay Club Marin, along with 3-day advance booking privileges Enjoy full access to our exclusive international squash courts and robust programming and events. Up to 4 complimentary Lifestyle Points each quarter Use for guest passes or roll over to use on an array of in-club services. Unless noted above, indoor and outdoor tennis court access requires a Club West Collection Membership. Fitness, aquatics, basketball, squash, group exercise, social programming, and childcare privileges, and more Enjoy a wide assortment of amenities designed to enhance your active lifestyle. Outdoor tennis court access at Bay Club Santa Clara and SF Tennis Power your passion for tennis with access to beautiful courts, world-class programs, and a dynamic community. 20 complimentary Connect hours Check in on work or meet with clients—without having to be at the office. 10 complimentary Connect hours Upgrade your desk view with work-ready spaces and enjoy time outside the office. To learn more about the below membership options, select Inquire below. This membership option offers social and fitness access to a single Bay Club location and is available at select clubs. 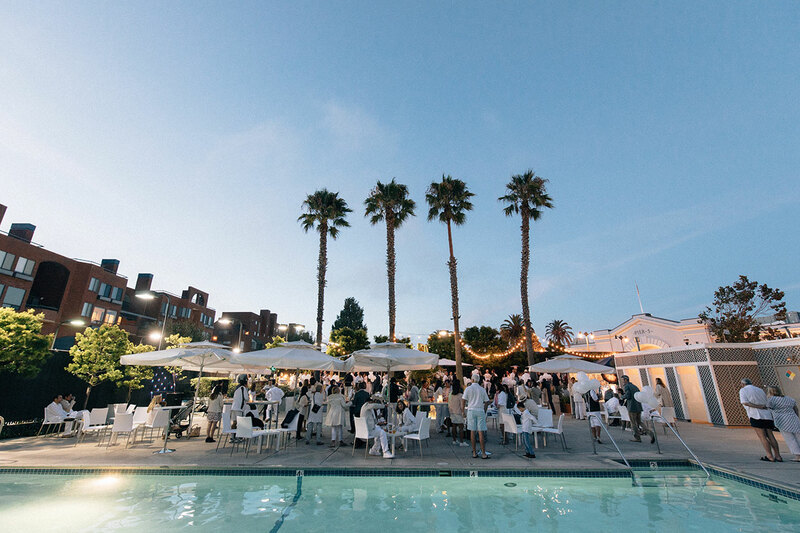 Available to members ages 29 years and younger, the Young Professional Membership lets you explore the full Bay Club lifestyle through access to your preferred Bay Club properties. Corporate success is directly linked to attracting and retaining top talent. Having the right mix of health and lifestyle offerings is what can give your organization the competitive edge—and Bay Club can help you with both! Available to members 65 years and older, the Senior Membership lets you explore the full Bay Club lifestyle through access to your preferred Bay Club properties. At the Bay Club, we believe there’s nothing wrong with wanting more. More of the experiences you love. More of the amenities and services that enhance your life. And more of the privileges you’ve worked hard for. From luxury amenities and facilities to one-of-a-kind experiences for the whole family, discover all the ways you can live life happy at the Bay Club. Fill out the information below and we’ll get in touch to explore the best membership for you. We’d love to invite you to the club closest to you so we can show you everything our community offers.